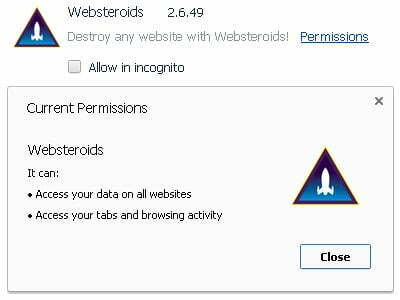 This article has been created to comprehensively describe the characteristics of Websteroids adware and provide recommendations on removing this pest from the system and all web browsers affected. Not quite a severe virus in the generally accepted sense, Websteroids still causes a great deal of frustration to the users who happened to catch or download this browser extension. The basic symptom is online ads being randomly displayed in web browser tabs, distorting the look of visited sites to a large extent. Moreover, the adware tends to generate an abundance of ad types, ranging from pop-ups pushing certain products or services – all the way to hyperlinks directly embedded in a website’s text. Sadly enough, Websteroids add-on is frequently downloaded and installed by users themselves who believe it’s something that will add some zest to their web life. An alternative computer infiltration path exploited by this PUP (potentially unwanted program) involves bundling with third-party software like video players, codecs, or similar auxiliary components that are widely available online. Of course, in the latter case the presence of the app being scrutinized is stated as part of the download, but often times it’s done in a somewhat covert form; therefore it’s strongly recommended that you pay special attention to any setup wizards you come across, and deselect the stuff you’re not sure about. 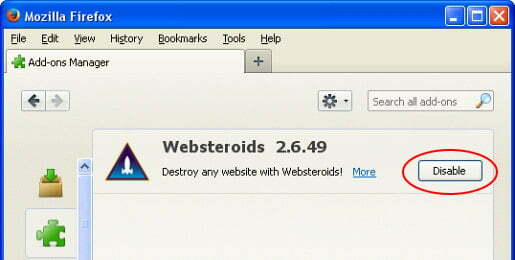 By the way, ironically, the home web page for this dubious software at Websteroidsapp.com claims that it can be used to “destroy ads”, with an exclamation mark next to the phrase. Well, apparently, instead of doing that, it appears to stick to an absolutely contrary strategy, flooding the browsers with yet more ads. The way the authors of this app benefit from distributing their product on a large scale is they get paid for showing the advertisements to users. Also, this adware is known to collect data on its victims’ web surfing preferences, thus tracking user activity – which is obviously not a good thing in terms of one’s privacy. Elimination of Websteroids infection can be efficiently accomplished through the use of reliable security software. Sticking to the automatic cleanup technique ensures that all components of the adware get thoroughly wiped out from your system without a chance for the bug to persevere in there. 2. The scan will come up with a list of detected items. 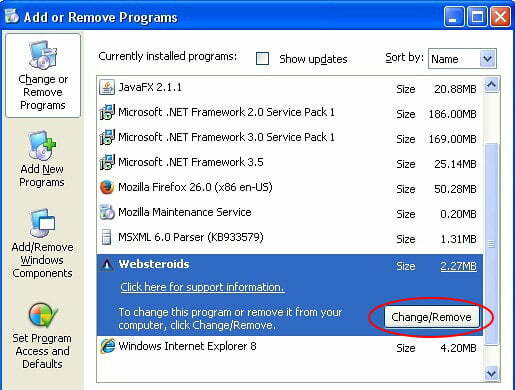 Click Fix Threats to get Websteroids removed from your system. Completing this phase of the cleanup process will most likely lead to complete eradication of the infection. However, it might be a good idea to consider ascertaining the malware is gone for good. 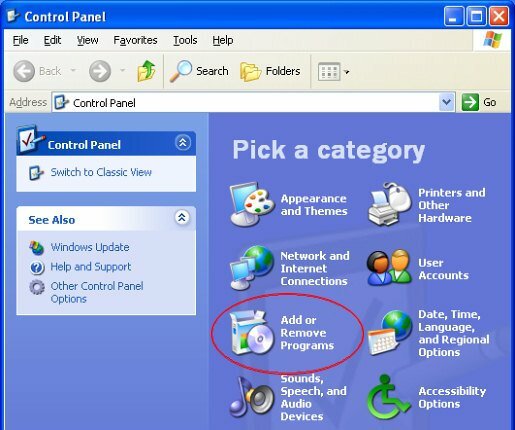 • In the left-hand pane, select Extensions. 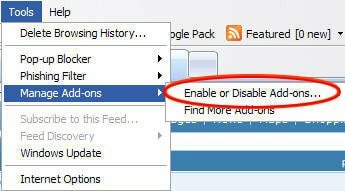 Locate Websteroids in there and click Disable button next to it. 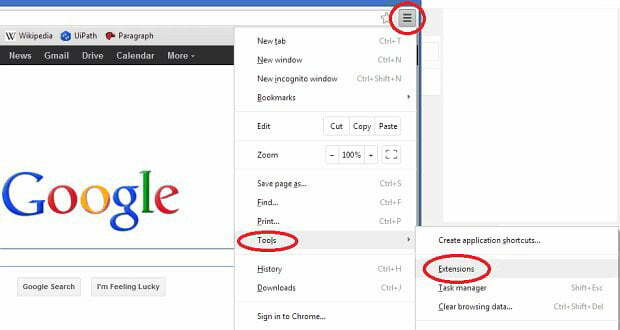 • Select Toolbars and Extensions under Add-on Types. 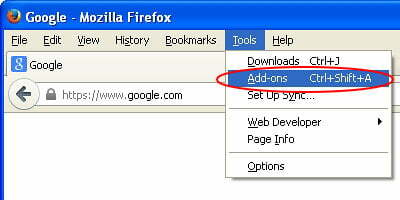 Find Websteroids entry on the list, right-click on it and pick Disable option.